Well, I got an alert that there was an update waiting to install on my G1 (HTC Dream) today, but before I let it install I took this picture showing the phones uptime. 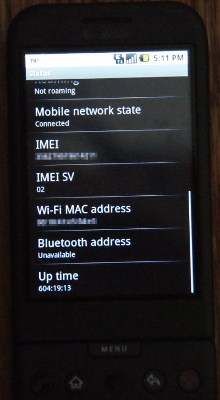 I am not aware of many smart phones that can come near an uptime of over 25 days. I know my Windows Mobile phone needs to be rebooted on a regular basis. If you have a phone that will has a great uptime please comment. Also, I am shooting for 1000 hours next time.